I can't tell if my tastes are getting preppier or if Kate Spade is just getting hipper, but either way I've found myself enamored of the brand lately. It struck me one day last week when I stopped into the Newbury Street outpost to see if I could get my hands on a bathing suit on sale from Kate Spade's collaboration with Malia Mills. (In case you're unfamiliar, Malia Mills swimsuits are expensive as all hell, but they flatter like no other. Seriously.) Well, the suits were sold out, but I did find a veritable menagerie! Armadillos and camels and cockatoos, oh my! Preppy or not, I can't help but love it. that armadillo is so cute! the armadillo bag totally reminds me of steel magnolias! my mom has recently become obsessed with kate spade, so she is passing on her love to all her girls. i got my hands on a new bag in hot coral, love! omg...i just got that armadillo bag! i was so enamored of the elephant one from like last year or 2 years ago & was mad they completely sold out. couldn't even find one on ebay, so didn't want to lose out again! SO fun, I love all of these! That clutch is adorable! I think Kate Spade has gotten hipper. They did a great campaign last year with the tagline "More is More" with girls wearing loads of bright jewelry. It was awesome! I love Kate Spade but the armadillo is too far for me LOL. have a great weekend! Kate Spade always manages to surprise me, totally wasn't expecting a cute armadillo bag & camel prints! Lovely, thanks for your comment - fyi I sometimes have absent-minded moments too and you're anything but what you said, miss multifaceted fabulousness! 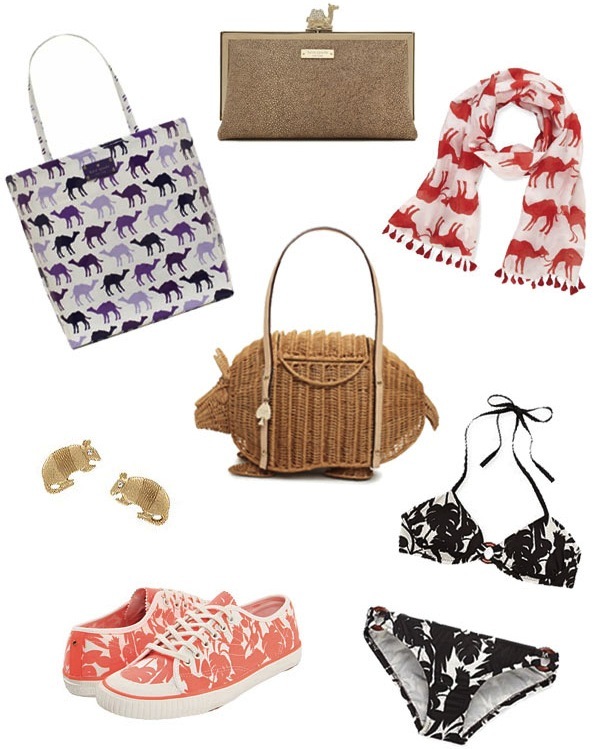 I'm a bit obsessed with animal-inspired goodies :-) Love all these picks - that camel clutch is just gorgeous! Love the camel clutch and the armadillo studs! All these items are SO cute! Love kate spade new york! Hi there, I'm on this page for the first time. I noticed the link on a board talking about discount car rentals san diego california and I think it is actually helpful and it also helped me quite a lot. I hope to offer one thing or another in return and assist other people like you served me. dollar car rental las vegas airport phone number. Thank you and I am anticipating getting in connection with you. to create this excellent and interesting posting on car rental in jersey city. You're really a excellent website owner. The website loading time is awesome. It seems that you're having some unique secret. Furthermore, the information is definitely a masterwork. rental orlando airport lost and found! A good post regarding alamo car hire france, although I'm unsure in regards to where you have got this information from. I will need to spend some more energy investigating it to have a even better knowledge of this issue. I had been trying to find this info to use it as part of a project, thank you so much for this good info. I've been searching on the web over 4 hours today interested in information about cheapest car rental rates in orlando florida, yet I haven't stumbled on any great article similar to yours. as you did, the internet may be way more beneficial than ever. incredible. It seems you are doing some unique secret. Additionally, the information is definitely a masterpiece. Magnificent goods from you, man. I have understand your stuff before also and you're just extremely magnificent. I actually like what you have acquired here, certainly like what you're reporting and the way in which you say it. You make it compelling but you yet take care of to keep it wise. I can't wait to read more from you. This is actually a tremendous web site.